Electoral College Certifies Trump Win, But Elite Still Working On End Game – Coercion Code – "Dark Times are upon us"
The U.S. Congress on Friday certified the Electoral College vote that gave Republican Donald Trump his victory in the contentious 2016 presidential election after a raucous half-hour joint session punctuated by Democratic challenges. The Republican businessman, whose presidential campaign was his first bid for public office, garnered 304 electoral votes, compared with 227 won by his Democratic challenger, Hillary Clinton, according to the vote tally read by Vice President Joe Biden. The electoral votes were opened before a joint session of Congress in what is considered a formality for most presidential elections. Members of the House of Representatives objected to the electoral tally in states including Alabama, Florida, Michigan, Texas, Mississippi and the Carolinas in a symbolic move that exposed lingering dismay over a contentious election campaign. Some members complained about long lines at polling stations while others cited concerns over Russian attempts to influence the result in Trump’s favor. “I object because people are horrified by the overwhelming evidence of Russian interference in our election,” said Representative Barbara Lee of California before being overruled. Biden denied the objections one by one, at times jocular and apparently determined to finish the tally. “It is over,” he said at one point, to laughter from Republicans. None of the representatives had the backing of a senator, which would have allowed them to suspend the joint session and allow the House and Senate to meet separately to debate the objections. Although Trump, who is set to take office on Jan. 20, won the Electoral College vote that determines the victor, Clinton won the popular vote by nearly 3 million ballots. The election has been shadowed by concerns about Russian hacking of Democratic groups and other forms of intervention during the campaign. The intelligence agencies did not conclude that Russian hacking changed any vote tallies. But House Democratic leader Nancy Pelosi said concerns about Russian interference cast a pall over the 2016 vote. The new story over at CTVNews Canada reports the US Department of Homeland Security and the FBI have warned Ontario, Canada’s main electricity distributor that they may have been a target of malicious Russian cyber-activity. While Russia has officially denied any wrongdoing, we see in their story an attempt to continue the globalists narrative – to keep the minds of the people of America and Canada on the claim Russia is hacking into ‘the grid’. 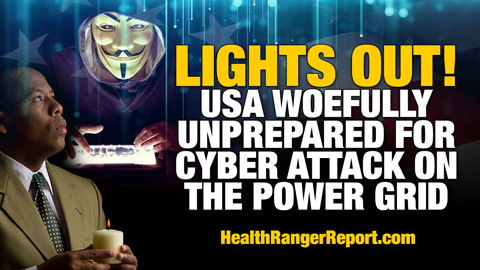 While a recent report by the Washington Post that Russia had hacked into the power grid here in America was proven to be ‘fake news’, leading them to publish a pitiful disclaimer, the damage was already done – a ‘bug’ was placed into the minds of millions of Americans that Russia was hacking into ‘the grid’ and was capable of doing so again, a claim that the new story out of Canada appears to corroborate. Setting Americans up for a ‘lights out scenario’ in which they now have their very clear ‘fall guy’ in Russia, we hear in the only video below from Dave with the X22Report why he believes America has never been in greater danger of the globalists pulling off the ‘event of all events’, warning us of all the different events happening now that show they’re taking this to the next level. Imagine awakening at 3 am to an almost completely dark and silent house, the heating system no longer working along with any and all electrical components such as alarm clocks and the ever-present lights on your TV set gone. While a somewhat common occasion for those of us living here in America in 2017 when big storms come along, the outages rarely last for more than a few hours or a few days while in most really bad scenarios, a week or more might be the case. And while anyone living through such an outage knows that it comes along with all kinds of difficulties and headaches, when the power and the lights come back on, all is usually quickly forgotten. However, as the X22Report tells us , every day we’re getting more indications that the globalists within the US government who hate America may be preparing ‘the event of all events’ to bring our country down. As has long been warned, any permanent shutdown of the power grid here in America could easily lead to a 90% population die off within the first 9 months afterwards with a huge proportion of them dying within the first week once it became apparent that the lights won’t be coming back on. With alleged Russian power grid hacking attempts being tied to Canada now as well, possibly more ‘fake news’ and propaganda according to Dave, is there any reason to believe they won’t go through with their ‘kill shot’? The new story over at the Daily Mail that Steve Quayle linked to on his website this morning reports that a ‘zombie outbreak’ could come close to wiping out humanity in 100 days while reporting that within 6 months, the human race would be history. And while this is just the latest ‘zombie outbreak’ story that we’ve heard the mainstream media pushing over the last several years, the fact that most people would consider a mobile phone a key survival tool in the apocalypse as they report also tells us why so many won’t make it past the first day should such a scenario ever occur. With the same scientists who crafted this ‘outbreak experiment’ actually claiming that NOT FIGHTING BACK would be a ‘tip to survival’ since zombies don’t feel pain anyways, we have to ask, are they just setting up the sheeple for their fall? Not fighting back in that life or death scenario is the best way to ensure that the only outcome is ‘death’. Not surprisingly, not fighting back led to a 100% mortality rate in their study after 6 months. Imagine a massive hack upon our power grid that takes down electricity across the country or even a ‘zombie apocalypse’ happening in America. Hey millennials, how’s that cell phone working out for you? If they were planning on calling the government to save them, we wouldn’t advise that as in such a ‘world ending’ scenario, all of the smart folks who worked for any government agency would be long gone from their jobs, home protecting their own families. As Mac Slavo tells us in this new story over at SHTFPlan, the future tends towards the path of greatest destruction, perhaps, because the system has been set up for such a fall. 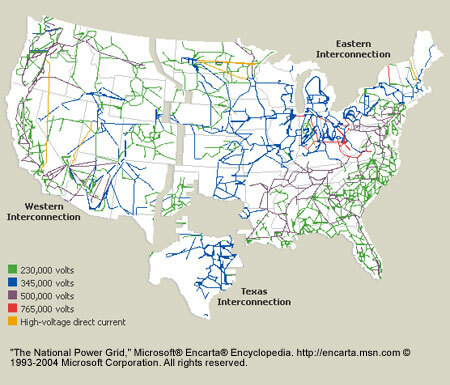 Nothing would hasten America’s destruction more than our power grid somehow being brought down. With the globalists who’ve long hated and been working towards the destruction of America still in power here until Trump gets into office, we wouldn’t put anything past them as they sulk down the homestretch. Seemingly attempting to set up a false flag attack upon our power grid that they’ll blame upon Russia, the still sleeping masses will believe it as they try to use their cell phones again and again for help, only to be met by crickets. Last night we were awoken here at 3 am by the sound of silence and while we quickly broke out our LED lanterns to see, there’s nothing like an unexpected, real-world power outage experience suddenly thrown in ones face to help show how completely dependent most of us have become upon it. And while the power came back on, there is a very real chance that one day it won’t. And with globalists seemingly preparing us for their ‘main event’ and the ‘false flag of all false flags’ as Dave tells us of in this video, we can use such experiences as a dry run for that ‘future event’ while keeping in mind, next time the power goes out, it might just be forever. A quick flashback because the timeline of events indicates the establishment elite, or the political class if you prefer that term, has been systematically ushering in the New World Order, a world controlled by “international norms,” where globalism trumped national sovereignty, until Donald Trump threw a huge wrench into the works by not only tossing his hat into the ring for the presidential election, but then beating out 16 Republican primary candidates, then going on to run against Hillary Clinton. I would be incredibly wealthy if I had a dime for every time the MSM claimed Trump didn’t have a chance to win, as the MSM relentlessly trashed Trump every single day, but it wasn’t until Wikileaks started publishing the DNC leaked emails that the “Russian hacking” meme started being spouted by the MSM, always quoting unnamed U.S. officials as their sources. The timeline is critical to remember because the so-called “powers that be,” globalists and the political establishment, were watching Trump, the nationalist, rise while their globalists candidate, meant to finalize their end game plans of total globalization and the NWO, was sinking, as Wikileaks revealed DNC corruption first, then collusion with the media, hitting the Clinton campaign next, with the Podesta emails. Plan A was always to insert their globalist puppet into the White House, so that when their agenda was in its final phases, they had someone in place to take out their intended targets, who were already “labeled” by the Obama administration as “dangerous,” and “potential domestic terrorists,” namely veterans, second amendments supporters, gun owners, constitutionalists, Christians and Evangelicals, preppers, survivalists, etc…. When Trump began to rise and many saw he could potentially win the presidential election, despite the mainstream media insisting at every turn that he couldn’t, they started implementing their Plan B, which was their ultimate distraction by mis-direction. First they claimed Russia could hack the election results, these warnings came before the election date. Then they claimed Russia could hack the information hubs that provided the results to the public, again, those reports came before the election occurred. Then they told the public to focus on “Russian hacking” rather than the information contained within the emails showing the corruption within the Clinton campaign and the DNC. After Trump won the election, the “Russian hacking” meme was unleashed in full force, with the CIA saying not only did they hack the DNC and the Clinton campaign, which at first was contradicted by the FBI until they were brought back into line, and they were all constantly wording it as “hacking the election,” rather than the DNC/Clinton campaign. Then the utterly fake story from Washington Post that Russia hacked the U.S. power grid, only to be retracted in a later story saying Russia did not hack the grid. Anyone else get the feeling the Obama administration and the MSM want all eyes on Russia for some reason? First lets put that meme to rest as John McAfee, founder of McAfee antivirus, a man who has made a name for himself in cyber security, talks about what he heard during the congressional hearings, where he begins by stating “Today the most deceptive propaganda to date, was perpetrated on the American public,” as he breaks down the four “facts” the U.S. intelligence community claims helped them determine the Russians were behind the hacks, where he states the report is “utter nonsense,” and how the U.S. intel report actually validates Moscow. The good news is McAfee breaks it down in a manner where non-technological savy people can easily understand. Ironically, McAfee busts the U.S. government on their “utter nonsense” on Russia Today, which does seem to be poetic justice. Now that we know that the whole Russian hacking meme is total BS, we have to look at what is happening that they are trying to mis-direct us from and how they are using it to distract their intended target, President-elect Donald Trump. 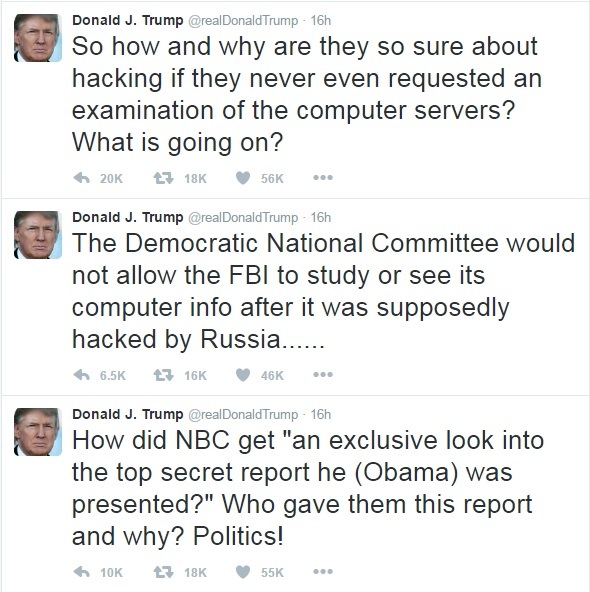 President-Elect Trump has been questioning the U.S. intelligence community about their “evidence,” with a report from The Hill saying he intends to revamp the intelligence agencies, using Twitter to communicate with the American people about the so-called hacking and the reports. Respectfully Sir, you have bigger fish to fry, countries, including the U.S. have been hacking into each other for decades, globalists are trying to distract you from the “Purple Revolution” that was set into motion the day after your election win, orchestrated and sponsored by the king of color revolutions, Geoge Soros, and his puppets in the political establishment and the MSM. The ‘Purple Revolution” was kicked off here in the U.S. the day after the 2016 presidential election, explained in an ANP article by Stefan Stanford on November 12, 2016. Defeated Democratic presidential candidate Hillary Rodham Clinton is not about to «go quietly into that good night». On the morning after her surprising and unanticipated defeat at the hands of Republican Party upstart Donald Trump, Mrs. Clinton and her husband, former President Bill Clinton, entered the ball room of the art-deco New Yorker hotel in midtown Manhattan and were both adorned in purple attire. The press immediately noticed the color and asked what it represented. Clinton spokespeople claimed it was to represent the coming together of Democratic «Blue America» and Republican «Red America» into a united purple blend. This statement was a complete ruse as is known by citizens of countries targeted in the past by the vile political operations of international hedge fund tycoon George Soros. 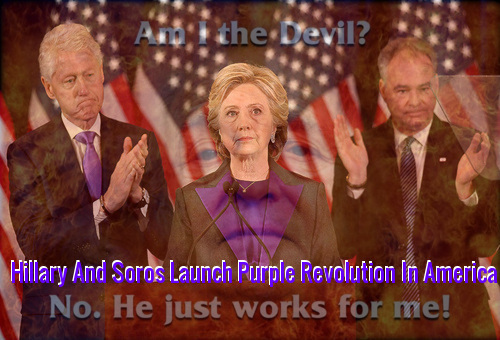 The Clintons, who both have received millions of dollars in campaign contributions and Clinton Foundation donations from Soros, were, in fact, helping to launch Soros’s «Purple Revolution» in America. The Purple Revolution will resist all efforts by the Trump administration to push back against the globalist policies of the Clintons and soon-to-be ex-President Barack Obama. The Purple Revolution will also seek to make the Trump administration a short one through Soros-style street protests and political disruption. In the midst of the breathless headlines about “Russian hacking” we have seen a failed attempt to overturn the election with recounts in the three states Trump flipped to win the electoral votes needed to become the President. That was followed by another failed attempt where the electors lives were threatened if they voted for Trump. We have also seen an organized set of protests, with an all-out riot in Oregon against Trump’s election. Right now we see reports of groups attempting to stop Trump from taking office, such as the petition from the left asking Obama to declare martial law, the attempts to have the electors declared illegal voters, attempts to get Democratic lawmakers to challenge Donald Trump’s election on Friday, when Congress meets in joint session to certify Trump’s Electoral College victory. There are also a large number of groups and organizations planning protests of Trump’s inauguration all across the country. What everyone needs to understand is that none of these antics since the election is meant to actually stop Trump for becoming the 45th President of the United States of America, although they are giving it a few hail mary’s to save their “ministry of truth ” to destroy Independent Media, they understand the chances of success there are almost impossible. Everything we see happening is being done with the specific purpose of fomenting discontent, increase tensions and creating an internal revolution by stoking tensions, to bring about acts like the brutal kidnapping and torture of a white male with mental disability by four black thugs, yelling “F*\k Trump” and “F**k whites,” all broadcast live on Facebook. The race war is in full swing as globalists continue to incite racial divisions. Politically we see marching bands are under fire for performing at Trump’s inauguration, and “UW-Madison’s Young Americans for Freedom labeled hate group,” because they are conservatives. The whole purpose of a color revolution is to divide countries, cause internal revolutions and overthrow said country and a look at daily headlines shows they have done so spectacularly as America is more divided now that at any time in modern history. Athiests against religion, feminists attacking masculinity, races warring with each other, political foes labeling others hate groups, Independent Media under attack by mainstream media and democratic politicians….. can anyone think of one demographic or group in America right now that is not either attacking another or being attacked? That is the ultimate goal. That is why the Obama administration, the MSM, all want to keep all eyes on Russia…. not to start a war with Russia, although they really don’t care if they end up kicking one off in their rush to fulfill their agenda, but to mis-direct and distract Americans from the fact that there is already a war happening, right now, within America. Welcome to the Purple Revolution. Churches the #1 Target For Hate Attacks – An Average Of 105 Every Single Month!